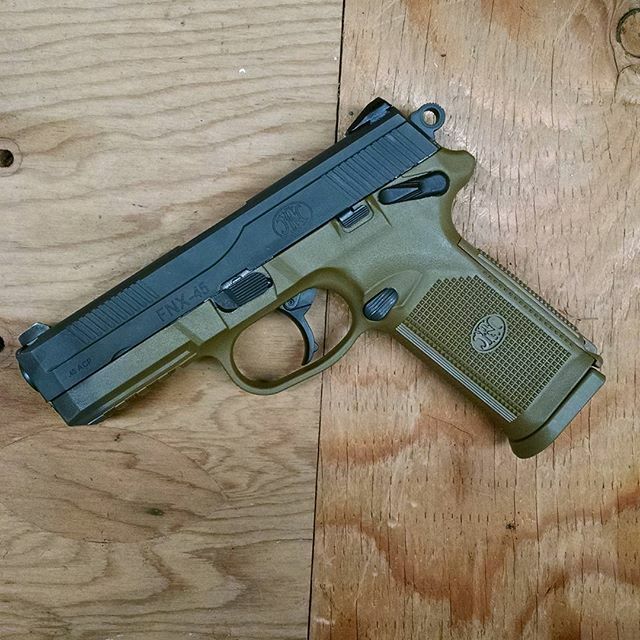 FNX 45 Tactical Pistol is one of the best .45 caliber double action pistols in the world. This monster holds 15 rounds of .45 acp, is completely ambidextrous, comes with 3 magazines and an awesome soft carry case. The checkered polymer frame is offered in Black and Flat Dark Earth and has a low-bore axis for reduced felt recoil and enhanced operator control. Two interchangeable backstraps come standard to quickly customize the grip feel. All operating controls are fully ambidextrous for ease of use. The 5.3″ cold hammer-forged, stainless steel barrel has a threaded muzzle to accept sound suppressors, compensators and other accessories. 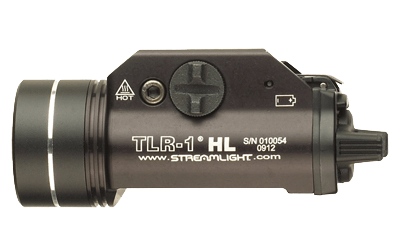 The stainless steel slide has high-profile suppressor height combat night sights and includes two mounting bases to accept multiple styles of optional red-dot electronic sights, including the top of the line Trijicon RMR Adjustable LED Red Dot. This mounting system allows the user to mount practically any RMR on top of the firearm, directly attached to the top of the slide. This feature allows the shooter to keep both eyes open while shooting which helps with maintaining a full field of vision. 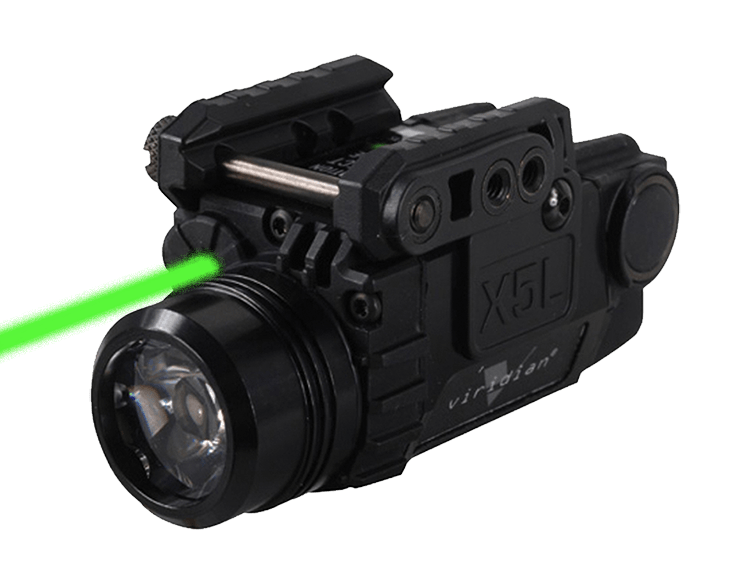 Modify Holster: Which Laser/Light Should The Holster Accommodate ? Suppressors are regulated under the National Firearms Act and require a local Class III dealer to receive the suppressor and file the required Form 4 paperwork with the ATF. If you select a suppressor we will be happy to guide you through the process. Pick the color you want your Five seveN! Cerakote the slide the same color? 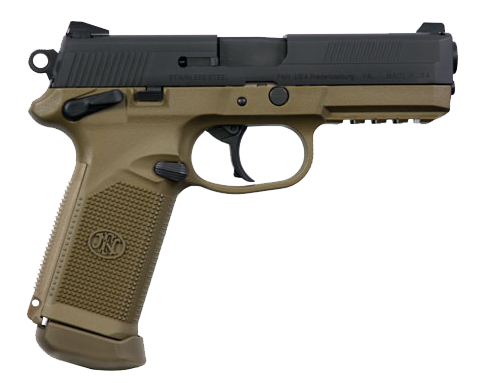 FNX 45 Tactical Pistol is one of the best .45 caliber double action pistols in the world. This monster holds 15 rounds of .45 acp, is completely ambidextrous, comes with 3 magazines and an awesome soft carry case. The gun itself is super light, comes with suppressor height night sights so you can add a suppressor to the front of the threaded barrel and still be able to use the sights. The top of the slide also has an existing cut out for an RMR red dot sight, we prefer the Trijicon RMR Adjustable LED Red Dot 3.25 MOA – RM06. 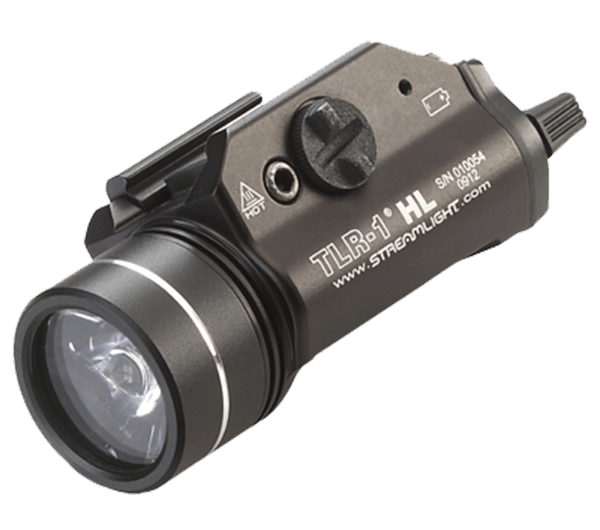 This site is by far the best of the bunch and allows you much more versatility than just a regular red dot. We use the IA Shepherd .45 ACP Suppressor on our FNX 45 Tactical Pistols, and what is awesome about this suppressor is it is a true multi caliber suppressor. All you have to do is change out the pistons that fit inside the suppressor and you can change the caliber from .45 ACP to ANYTHING BELOW IT! PISTOL OR RIFLE ROUNDS! 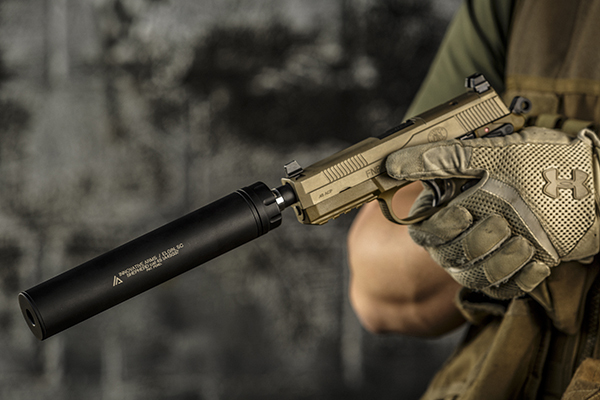 We actually use this suppressor on the FNX 45 Tactical, PS90, FN-15, and the FN 57 with the 10mm Adapter. This suppressor is one of the best out there! Improving on the FNP™-45 Tactical developed for the U.S. Joint Combat Pistol Program, the FNX 45 Tactical is the latest in technological advancements in handgun engineering, offering .45 ACP performance and a host of unique features that no other handgun can match.